Daylight saving time is upon us, and we are all suffering from that lost hour after “springing forward” last night. Daylight saving time is big news, typically garnering stories on reminders to adjust your clocks, the history of the bi-annual activity and how best to prep your internal clock for the time shift. For the past few years, the American Academy of Sleep Medicine (AASM) has leveraged the attention on the lack of sleep that surrounds daylight saving time to raise awareness of a very common and dangerous sleep disorder: insomnia. 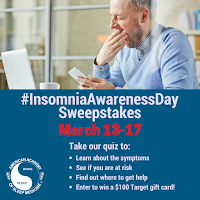 Insomnia Awareness Day takes place each year on the Monday after daylight saving time in the spring to educate the public on the symptoms, warning signs and treatment options for those who experience prolonged, disrupted sleep. Media interviews in print and online: TODAY.com, Newsweek, Real Simple, CBSNews.com, etc. As a result of the campaign, AASM will generate millions of impressions across all channels on Insomnia Awareness Day and throughout the week. But more importantly, valuable information on how to improve overall wellness by seeking treatment for insomnia will reach the public when lack of sleep is top-of-mind.